A delicious and easy Irish soup made with Guinness, perfect for getting cozy on a chilly day. 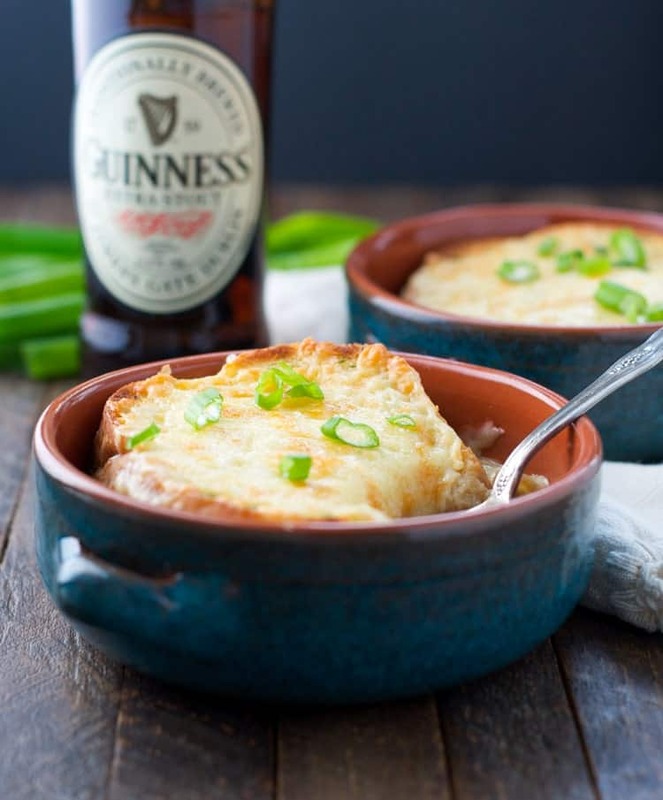 My favorite easy recipe for French Onion Soup gets an Irish twist in this Guinness Irish Soup — just in time for St. Patrick’s Day! 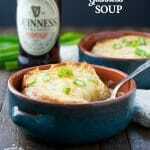 A subtle hint of Guinness Stout is added to the broth, while a thick slice of garlic bread is smothered in Irish Cheddar Cheese. It’s a delicious spin on a classic recipe, and it’s the perfect St. Patrick’s Day dinner! I have been making this recipe for Guinness Soup every March for as long as I can remember. It has definitely become a favorite that we all look forward to! Keith has plenty of Irish blood in his veins, so he loves to celebrate his heritage on March 17 (plus, it’s an excuse to drink more alcohol than usual). This Guinness Soup is really just a slightly modified French Onion Soup recipe. I have perfected my method for making the classic soup in an EASY way, and it tastes like a meal that you would order at a restaurant! For the Guinness Soup, I just add a bit of the stout to the beef broth for a very subtle taste. To make this as simple as possible for all of us, I also grab some frozen Texas Toast Garlic Bread to use as our topping. It’s so simple and SO good…especially when you top it with Irish Cheddar Cheese! The cheese might sound fancy, but I can pick it up at my local grocery store (and I live in the middle of nowhere), so I’m sure that you can get it too. I find it in the deli section at Walmart, as well. It’s worth the purchase because it’s sharp and rich and the perfect contrast to the sweet onions in the soup. If you’re planning an Irish-themed dinner for St. Patrick’s Day, a soup-and-salad combo would be perfect! Serve this Guinness Soup alongside a Reuben Salad and you’ll be all set! Cooking for Two? This soup serves 4 if it’s an entree, or 6-8 smaller servings. It looks like A LOT of onions in the pot, but don’t be fooled — they will shrink down in a major way after so much cooking! If you want to prepare a smaller portion, just cut the ingredients in half and you will have about 2 main course servings. Want to Prep Ahead? I like the to prepare the soup on the weekend when I typically have more time. I keep it in the refrigerator for up to a week, and just reheat it and serve it with the bread and cheese topping at the last minute. The soup base also freezes well. Melt butter in a large saucepan over low heat. Add onions to the saucepan and cover. Cook for about 30 minutes, stirring occasionally. Set heat on medium-high. Add beer and cook, uncovered, for 5-10 minutes, or until beer is reduced by about half. Add the beef broth and the Worcestershire sauce. Heat the broth mixture until it boils. Reduce the heat to low. Cover the pot and simmer for about 30 minutes. Meanwhile, toast or bake the garlic bread according to package instructions. Divide the soup between 4 bowls. Place one piece of toast on top of each bowl. Top each piece of toast with ¼ c. of Irish cheddar cheese. Place bowls of soup on a baking sheet and broil in the oven for a few minutes, or until cheese is melted and golden brown. This Guinness Soup recipe was originally published in March, 2015. The photographs have been updated in March, 2017! 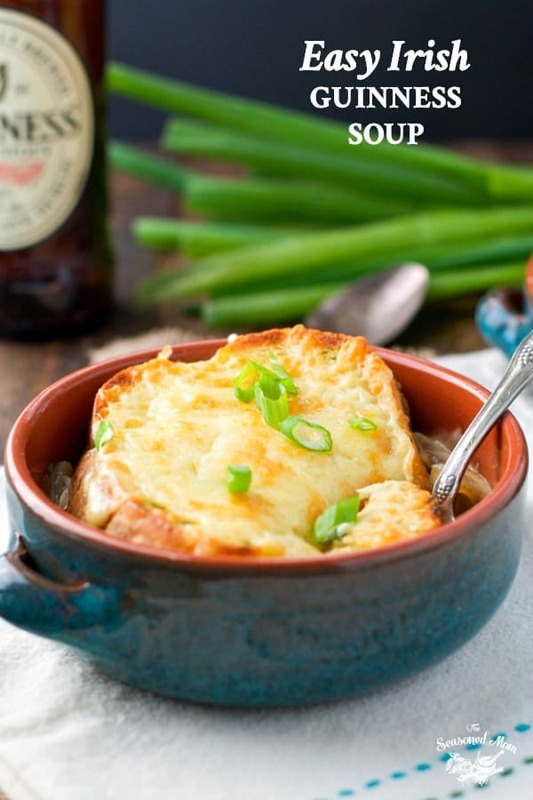 I love your twist on onion soup to go from French to Irish! It’s perfect for St. Paddy’s Day!! 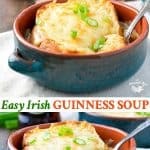 I love that you incorporated Guinness into this soup. It looks so hearty and perfect for St. Patrick’s Day! Thanks, Jen! It’s definitely hearty (especially for a vegetarian option)! It’s NOT a vegetarian option…beef broth!! I’ve never had Guinness soup, but it looks great! Thanks for linking up at Best of the Weekend! It’s got Guiness in it. Gotta be good. Can’t wait to try it. Awesome! Made it as one of my Irish themed meals for the week in honor of St. Patrick’s Day. We’ve always enjoyed French Onion Soup, and my husband loved your recipe! The recipe was extremely easy and the only ingredients I had to purchase were the Guinness Beer and Texas Toast. This will definitely be one of my must make soups. Thank you!!! By the looks of it, it’s going to be a blockbuster! I haven’t explored any recipes for a soup and I might consider this one for something new in the table. I just hope that Guiness Stout is available in the local grocer. Can you switch the beer to say Budweiser? Do you think this would work with vegetable broth to make it vegetarian? And perhaps a brown bread or soda bread for a full Irish theme? Hi, Carrie! Yes! Your suggestions should work fine! The taste of the soup will be slightly different with the veggie broth, but if you like that flavor you can go for it. Also, a brown bread or soda bread will work well, but make sure that you use a thick slice that can stand up to the soup and toast it first. Enjoy!